Anyone with products or memberships to offer can have an affiliate program. In fact, while you are shopping for that perfect cart choice, the ability to have an affiliate program or at least easily attach a plugin is an important part of your decision. Are you one of the naysayers shaking your head because you aren't making enough money to pay affiliates? Shake those thoughts off! Instead, consider the fact that affiliates bring you sales you'd have never gotten on your own. It's better to keep a percentage of those sales than get 100% of nothing, amen? I had my first taste of running an affiliate program when Alice Seba and I started Mom Masterminds back in 2004. It was amazing to see how our members would get motivated to share the membership when they earned half of everything. We loved sending out those commissions too! There are lots of ways to stretch your reach and bring in new business, like paying for ads – which involve you spending money in advance with the hope of bringing traffic that buys. I do a bit of advertising on proven funnels, but I'm still a big fan of the affiliate program side where I'm only paying for actual results. Affiliates are all around you. Look at your best customers and clients. Which of them can you contact one on one about being an affiliate for you? It's amazing what can happen if you ask people that already love what you are doing. Look around you to your contemporaries and direct competitors. It might seem crazy if you don't know any better, but my best affiliates are often in direct competition. Truthfully, my competition are my best friends, so it's an easy yes to work together and co-promote. It really can be as simple as asking people to JV with you. Well, once you have your affiliate program thought out and set up of course. By the way, if you're curious, I use aMember as my shopping cart and it includes a very reliable affiliate program. Once you have a few affiliates saying yes to promoting you, they're going to need creatives. They are more likely to act quickly when you give them email and social swipes, ready to take and tweak for their community. Hint: Look at your own conversion stats and see which emails about the product have a better response rate. Pull those out and then rewrite them a little bit as if they are coming from your affiliate to their community. Pro Tip: Having an affiliate tools area is awesome but also be prepared, if you want to inspire one of your high performing affiliates, write unique emails for them to send. You can personalize specifically for them and add in a bit of the relationship you two have. This takes time, but you are showing them how much you value your business relationship with them and cutting their work down – trust me, it has value! Nurture your affiliates and know this: Any one of them could break out and begin to send you lots of new customers. 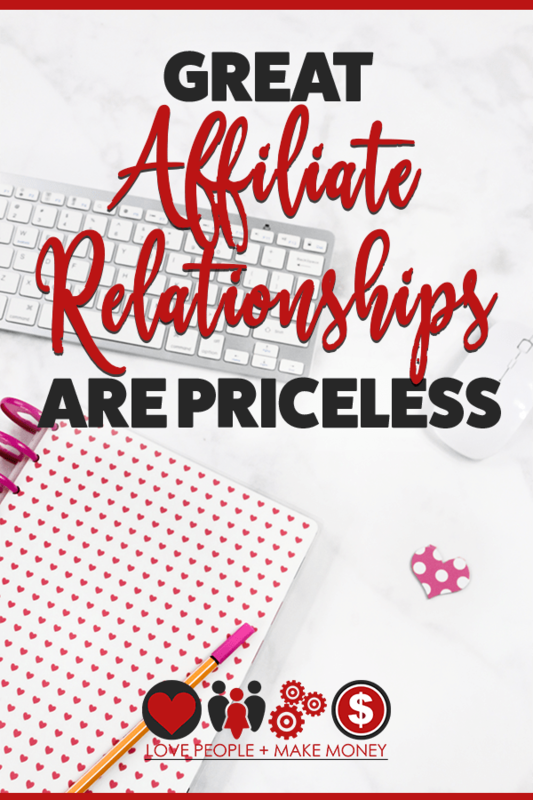 I know a lot of people who are focused on trying to attract someone already considered a Super Affiliate – but I have seen for myself after 15 years of running an affiliate program, there are potential Super Affiliates in my own community. Pro Tip: From the time an affiliate makes a first sale, you may want to reach out to learn more about them and the community they serve. Who knows what kind of magic you could create together. Building a good affiliate program means keeping it easy for affiliates to promote you. Make sure you contact them early about new product launches and ways to promote them. When you do create swipes, make sure you tell them often where they are located. I can't stress enough how much it helps when you include their affiliate link in any contact you have with them. While they have that email open it keeps it easy for them to shoot out an email while they are thinking of it. Making money is definitely fun, but take it a step further and appeal to an entrepreneur's natural competitive side. If your affiliates are open to it and you have a big upcoming launch, consider holding a sales contest. Everyone loves to stretch themselves and be seen ranking well on the leaderboards. Earning extra cash or prizes is definitely fun too! Want To Lean In On This More? I've really only teased you with ideas here and there's so much to know and play with. Building and fostering an affiliate program can be the key that scales your business upward. If this is on your wish list, I have a downloadable resource that digs deeper into many aspects of recruiting and equipping affiliates.